Functional and durable for hiking in the rain with a large pack. 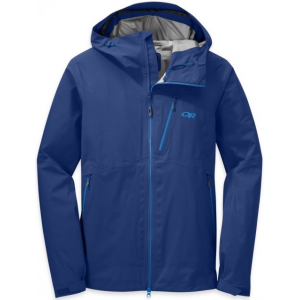 I think it beats a rain jacket and pants overall, in that it keeps the wearer dry down to the knee, AND keeps the pack dry, INCLUDING the shoulder straps, and isn't too "sweaty." An extra snap or two on the sides would make it darn near perfect. This is a one-size garment. I am 5'8" and about 160 lbs. It fits me very nicely. A taller or stouter person would be less well-covered, and a shorter person might find it excessively long, especially without a pack on. 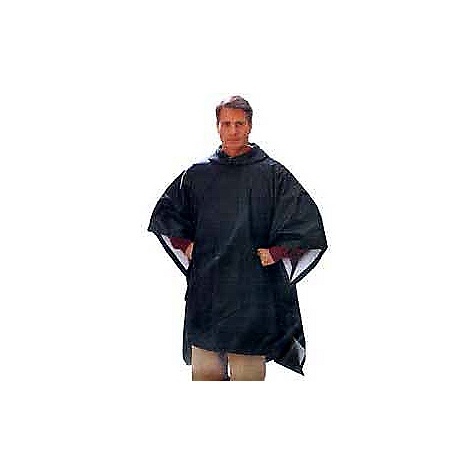 The poncho is wide enough to cover the arms down to about the elbow with arms extended. It is roomy enough to keep the arms inside while walking. I particularly like that the neck opening is large enough to easily get it over the head, and it has a cinch cord to tighten it around the wearer's face (or neck, if you leave the hood down, which I sometimes do when wearing a hat with a full brim). 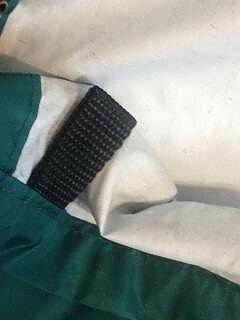 There is a strap with velcro at the back of the hood to adjust its size. Water Resistance: Absolutely waterproof. The shell is nylon backed with white polyuthrane (the tag says so). Water beads up off the outer shell, though. There is only one seam, inside the hood; it is taped. Breathability, Temperature, etc. : The material is waterproof, but as it's open at the bottom, and along the sides, it's relatively well ventilated. 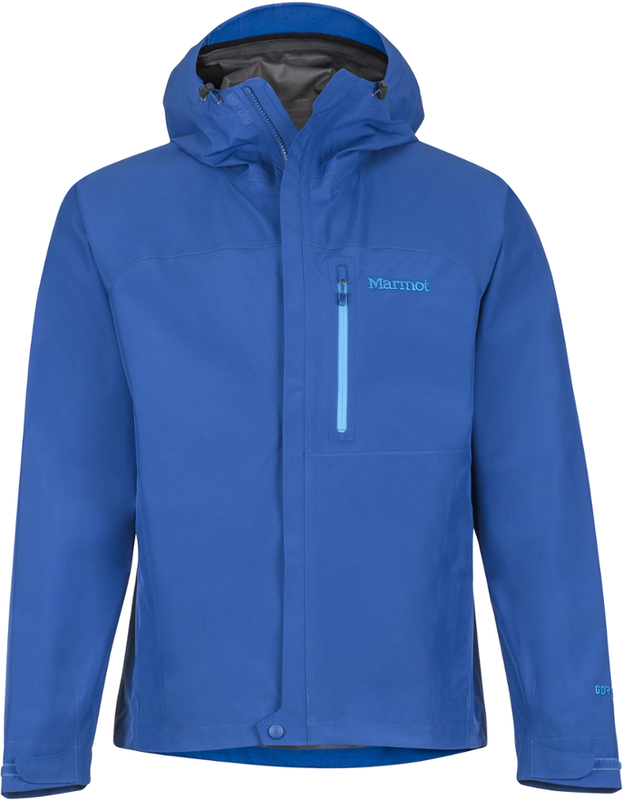 It fits well over other garments in colder weather, and is a reasonably effective shell, stopping the wind (and obviously the wet). Abrasion & Durability: I have had it for several years, and it shows no wear. It has not been babied—it's carried rolled up on top of a pack or in an open pocket, and certainly has gotten caught on rocks and trees, and has frequently been sat on, both while being worn and as a ground cloth. I am genuinely surprised that it has not snagged, and the inner coating has not cracked, peeled, or otherwise degraded. 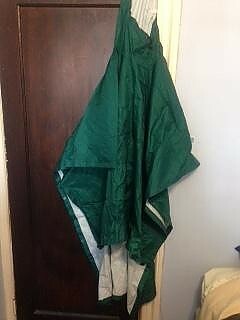 Conditions: I have used this poncho hiking and camping on the Eastern Seaboard (mostly New York) for about 20 nights per year (probably about 1/3 to 1/2 of those days were rainy). I have also occasionally used it to provide extra wind-blocking coverage in a hammock. I have used this poncho for more than five years. It has held up perfectly, and shows no significant wear. It is well-suited to normal backpacking, especially with a large pack. The only drawbacks I see in comparison to a rain jacket and pants are that the wearer's lower legs are not protected, and that if your hands and arms are out, they get wet, but quite frankly, if it's raining hard, I generally don't go scrambling up slick wet rocks. Great review of your poncho, MHW! 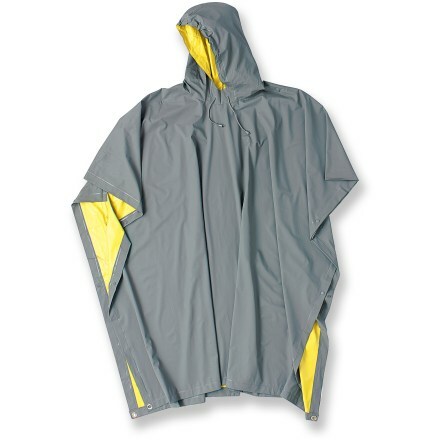 I love a poncho for the ventilation and keeping the pack dry like you mentioned, but I’ve gotten away from military colors and the brighter ones are really no stronger than kitchen trash bags. The one thing I’ve always hated about ponchos was getting wet from the knees down, but wearing lightweight rain pants with one has always worked for me. Tall gaiters or rain chaps would probably work, too. Thanks for the review! 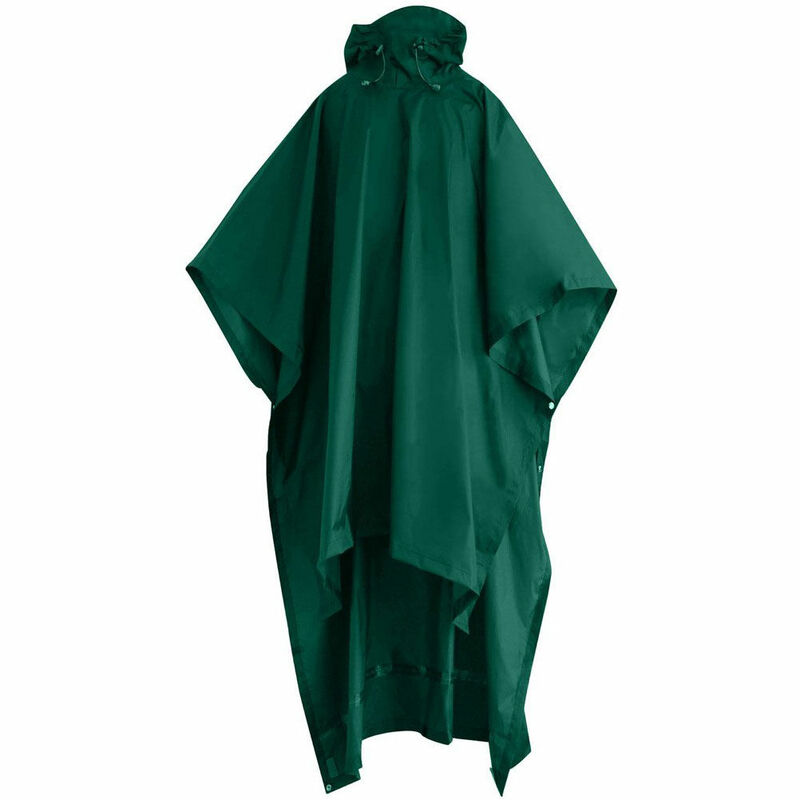 I wouldn't call the poncho a military color, more a bottle green than any shade of drab. I also don't think that mine is the Outdoor products poncho. 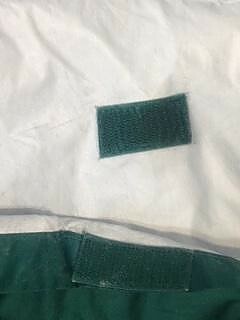 The tag just reads "Campmor," Campmor's current listings have what looks like the same thing (with the back flap) under the brand Redledge, which appears to come in a similar green and also royal blue. Thanks for the further info, MHW. 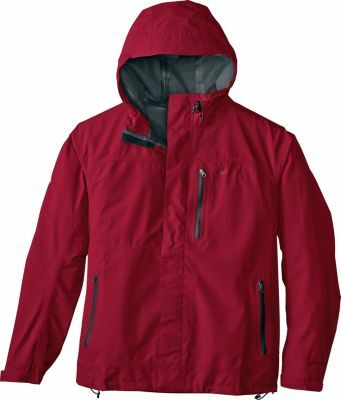 I've moved your review to be under the Red Ledge Storm Backpacker Poncho, since that seems to be the same product. Do you have a weight on this poncho. There is not on on the Red Ledge website. Thanks. Hi Jo Jo, I found a weight of 12 ounces listed for the poncho. Maybe, MHW can confirm that too. I have used the Campmor poncho in the Olympic Mountains in Washington. They are a rain forest so it rains a LOT!!! I found that one, which looks and sounds a lot like this one, to be a very good choice. It does vent well and keeps the pack straps dry. I did add additional snaps which helped. Great review and right on with both Pros and Cons. In response to Jo Jo Morrison. I weighed it on the postage scale: 12. 3 ounces. 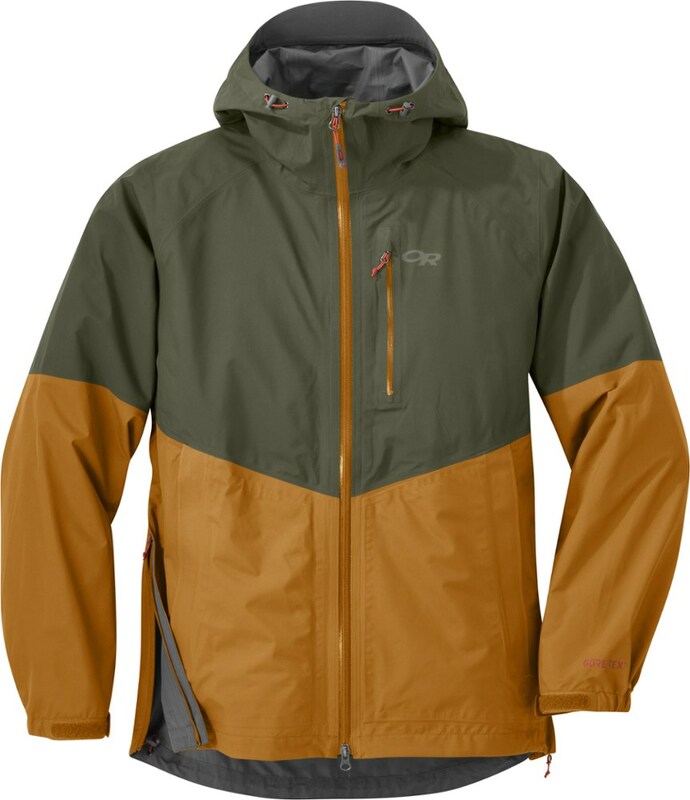 The Red Ledge Storm Backpacker Poncho is not available from the stores we monitor. It was last seen March 10, 2017	at EMS.